What amuses me when I visit any of the directory websites is the fact that books are categorized as “Entertainment” material. Of course, in many cases it is true. But, there come several books which go way beyond that and try to provide something significant. No doubt, that such books are the reasons that world history and the compendium of knowledge is preserved so far. 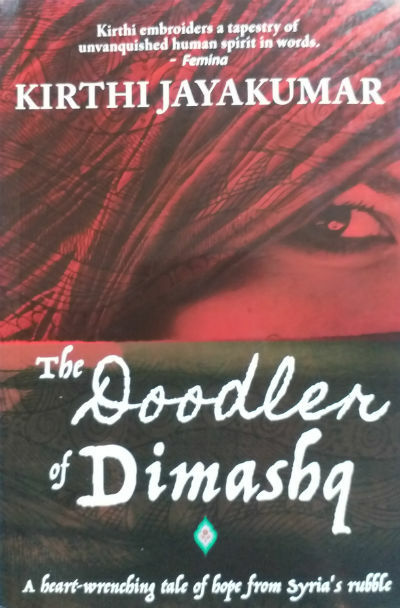 If you are looking for something worth reading which may be a little hard to read, as it will make you emotional, and talks about reality, here is a book – The Doodler of Dimashq. When I came across the book, what I knew was, it is written in Syrian crisis backdrop. Dimashq is known to the outer world as Damascus. The title of the book itself is intriguing. And, it made curious to know more about “what a Doodler’s experiences could have been?” in such a dangerous backdrop. I was also curious to explore how the author could have researched for the authentic stuff for this book. So, let me share my findings with you. The cover page is not very attractive or eye catcher at the first glance, but it explores the theme of the book quite well. The book title is written in white color with a black background and is a metaphor for seeing hope in the dark times. A young lady shown wearing a red scarf represents the protagonist and the tragic circumstances explored in the book. This way, we can say, the book cover represents the book quite well. I will give the cover page 4 out of 5 stars. Let us take a bird’s eye view at the plot of the book. Ameenah is a young school girl who is just 14 years old living in a small village of Syria. One day when she was doing her routine mischief in school she was summoned by the principal. She was scared that possible her teacher has complained about her. She, however, was called in for some other reason. Her elder brother came to pick her and inform that her marriage is finalized and soon she needs to get married and move to another city! One good thing, however, she was able to get confirmation about from her brother is, he will insist the groom to be to let Ameenah continue her study after marriage. Also, her teacher, who she was not fond of, comes as a help to her. She gave some links in the target city which will help her getting admission in the school there. Her married life was not easy, but, at the same time, it is not what we found explored in many such cases. Not only her husband but other family members also supported her. Of course, she is loaded with domestic work and much other stuff, but, her study was never taken away from her! And, her husband proves to be her new best friend. One day, however, unexpected (well, not completely) happened and her life turns upside down. What was the tragic incident? What loss was she suffered? And, how the things will move ahead from this point? Well, to get answers to these and many more other questions, you need to read the book:). We certainly believe that a book (or for that matter any media) is a result of skills, imagination, talent, passionate labor and many more attributes. Judging it is very easy, but making it from the scratch is a very tough thing. So, just giving a few stars to a book based on our personal likes or dislikes for the book (or sometimes for the authors, unfortunately) is not doing a justice to it. At the same time, we must understand that the world is almost flooding with books and other creative media these days and each of them is not worth your money and time. So, access to the unbiased views or reviews for the same can help the reader to make his/her purchase/read decision for the same. Here are our genuine views on this book. While we try to make it as many spoilers free as much possible, some of them are unavoidable. The book is definitely not a light read, as said earlier. The book is smaller and can be completed over the weekend. Some additional time may require digesting the content of the book for sure. The book tells an emotional story which is fictional but the references are taken from some of the real-life incidents and thus you can consider it as a historical fiction also. To know more about the source(s) of inspiration for the author to write this book, you should not skip the preface of the book along with the acknowledgment segment. Kirthi, herself is a social activist and is vocal about many real hard-hitting issues to the humanity and it is reflected in this book also. So if you decide that one man can do those things to your sister, and you choose that man, it is not haram? The book has literary qualities as well. The following line remained with me even after I’ve completed reading the book. His silence said much more. Emotions are the very tough thing to write about. Often we found lost at finding proper words even when we try to convey it to someone face-to-face. Kirthi did a nice job here in exploring them. For example, read the following line, doesn’t it convey the emotions quite interestingly? The weight of his words has hit me, colliding with the load of teas that stood at the cusp of my eyelids. Syria and the locales of the country are quite unknown to the people. The cities, villages, and locales are explored nicely in this book. The author is good at writing about surroundings. And, she adds literary gems to it as well. The biting cold has been locked outside by the closed windows. Freedom wasn’t going to come easily. And time would stand testament, as I would learn. At the same time, the orthodox traditions of the family are explored by the author without hesitation. …named as the mother of their oldest/only/first son, their own identities discarded. Just another way to remind the world around you that you are only as good as your womb is, in bearing sons. I would be like them – cook, clean, keep house, have more children than I can manage and be forgotten. The author has brilliantly put a link between an element of the Doodle and the incidents explored in the chapter at the beginning of each chapter. This is something interesting to go for. We wish that the author could have specified a more detailed glossary. And it could have been better if some words/phrases are explained inline or through footnotes. It certainly would have help readers to understand the things in a better manner and remain in the flow of the book. Overall a good book which is small (comparatively) and requires your attention while reading it. It is not a light read. If you reading meaningful books, this will definitely be a good choice for you. I believe that such books should be read and sold more. The author needs to be appreciated and encouraged for writing such meaningful stuff, especially when writing crap is quite easy and can give good market exposure also. Why can’t we create efforts in getting such books in bestseller category? Here are some of the other handpicked books we have talked about, which are similar to “The Doodler of Dimashq: A Heart Wrenching Tale of Hope From Syria’s Rubble”.